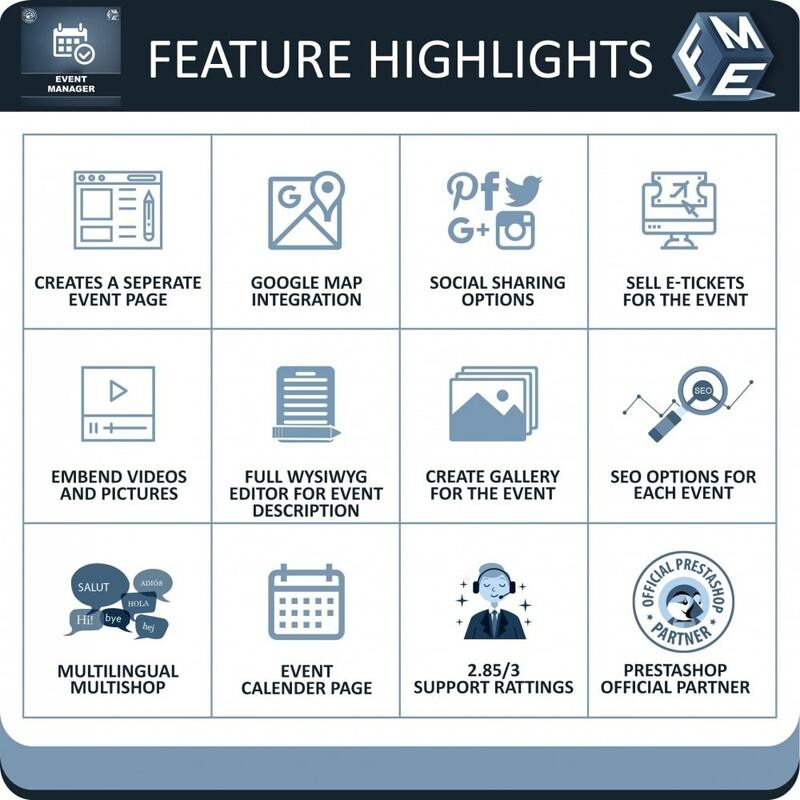 PrestaShop event module is a complete online events management system where you can create events by including tickets, date, time, event videos, image gallery, venue (show on Google maps), & much more. 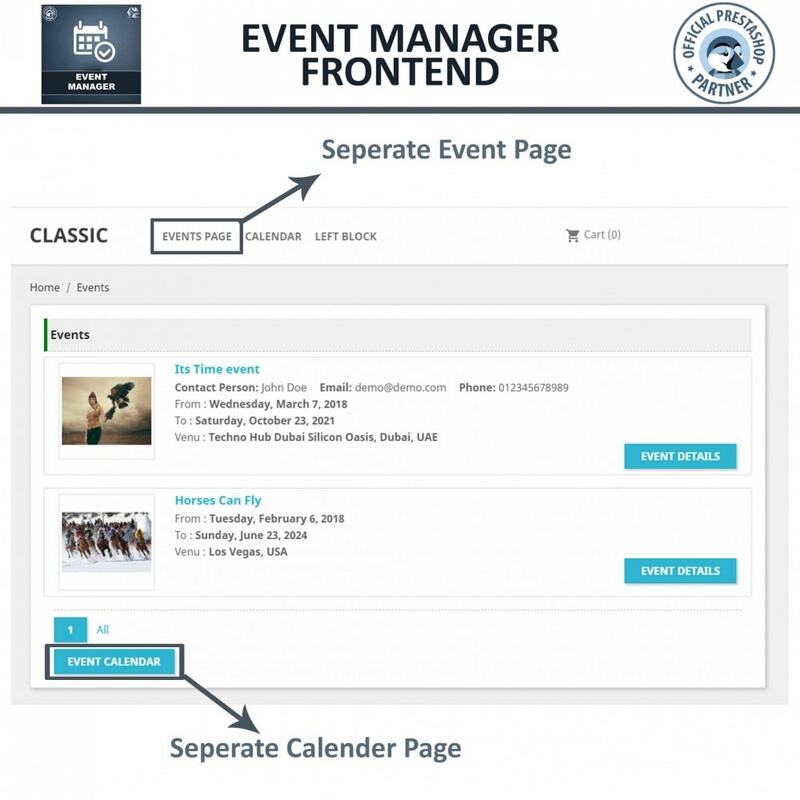 Provides calendar view for events. 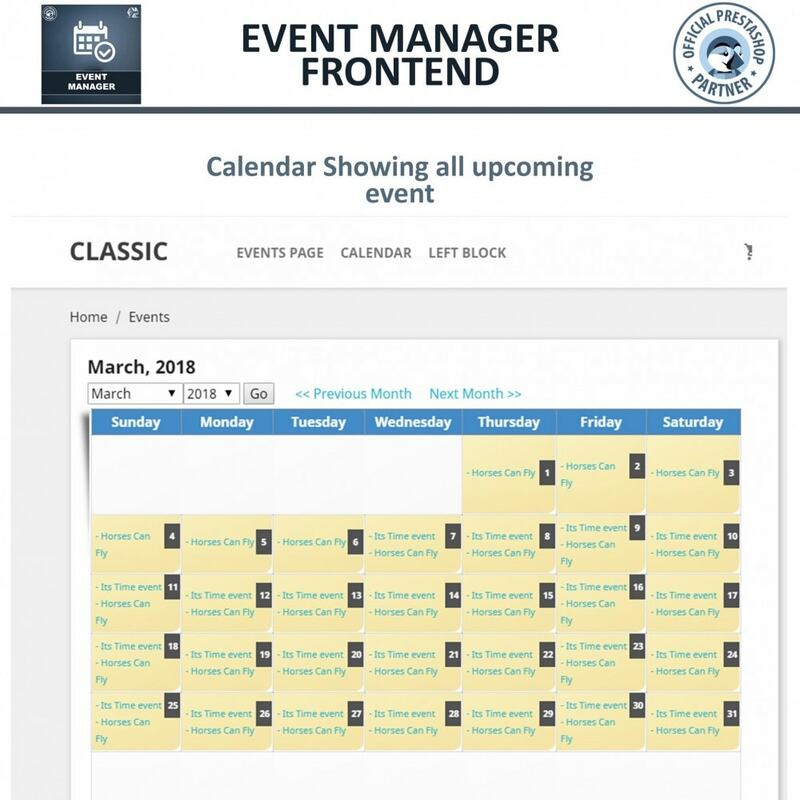 By using this PrestaShop calendar module, you can create & manage events on your website, it incorporates advance event management system that allows you to display Google maps, events calendar, events block, videos, social sharing buttons, eTicket sale (by creating virtual products) and many other features that are necessary to display any event. 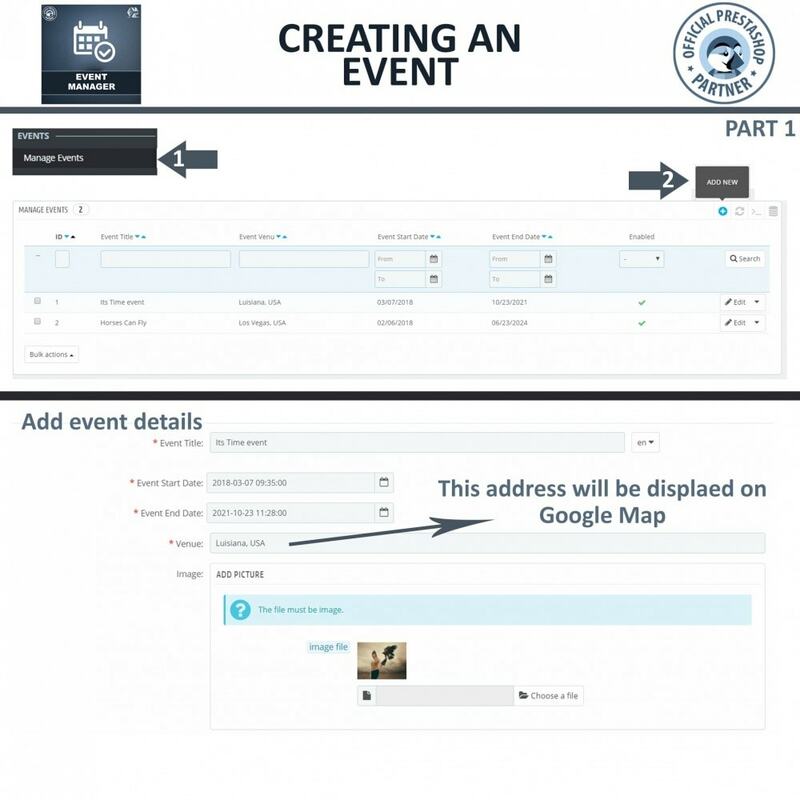 Now you can attach multiple products with events. Events calendar is displayed in a separate page from where users can easily see the upcoming events. 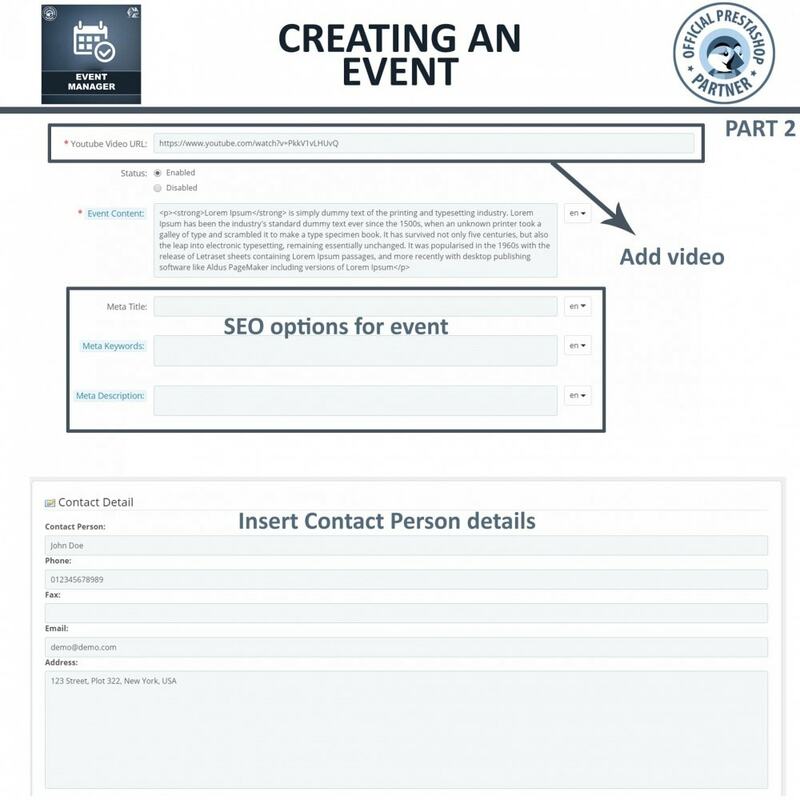 Upon clicking on any date a popup appears displaying the basic information of the event along with link to the event’s detail page and events’ wall page where all events are listed. 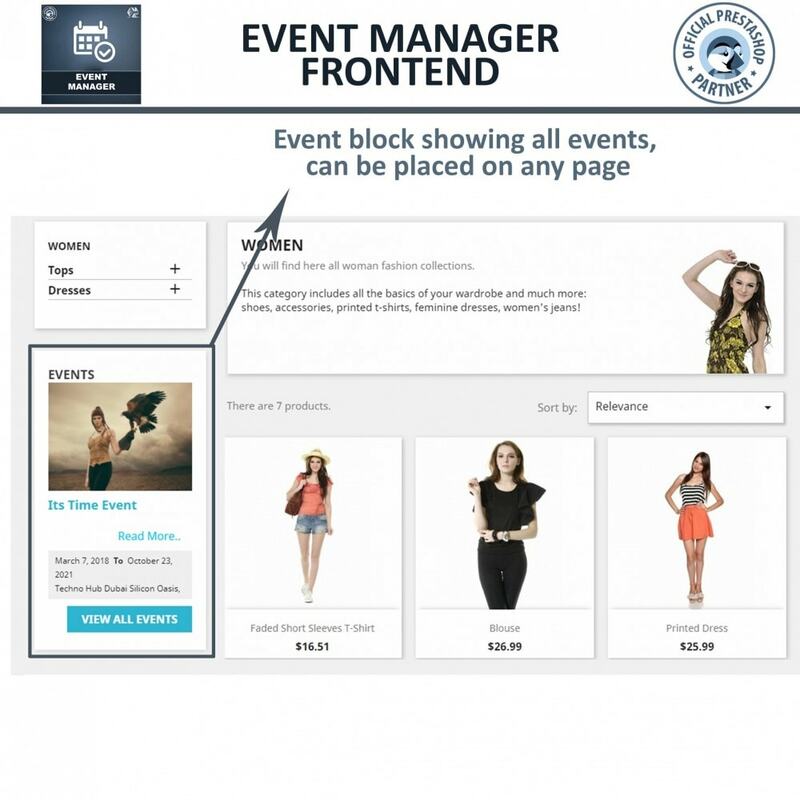 Prestashop Events calendar is fully configurable such as on hover map, popups etc. 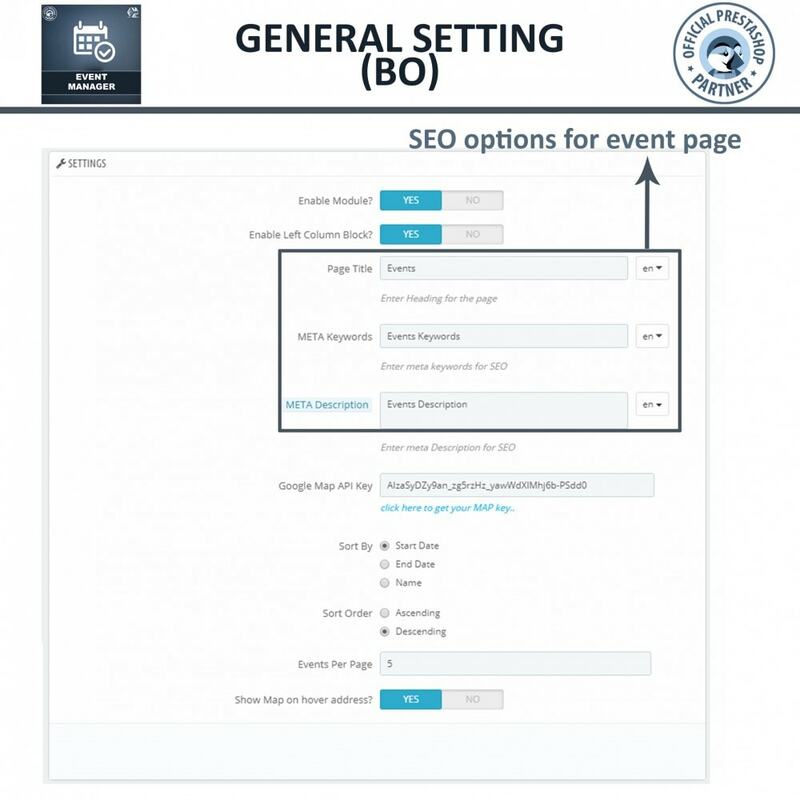 You can configure SEO settings for all events, add elegant image gallery and configure the slider settings. 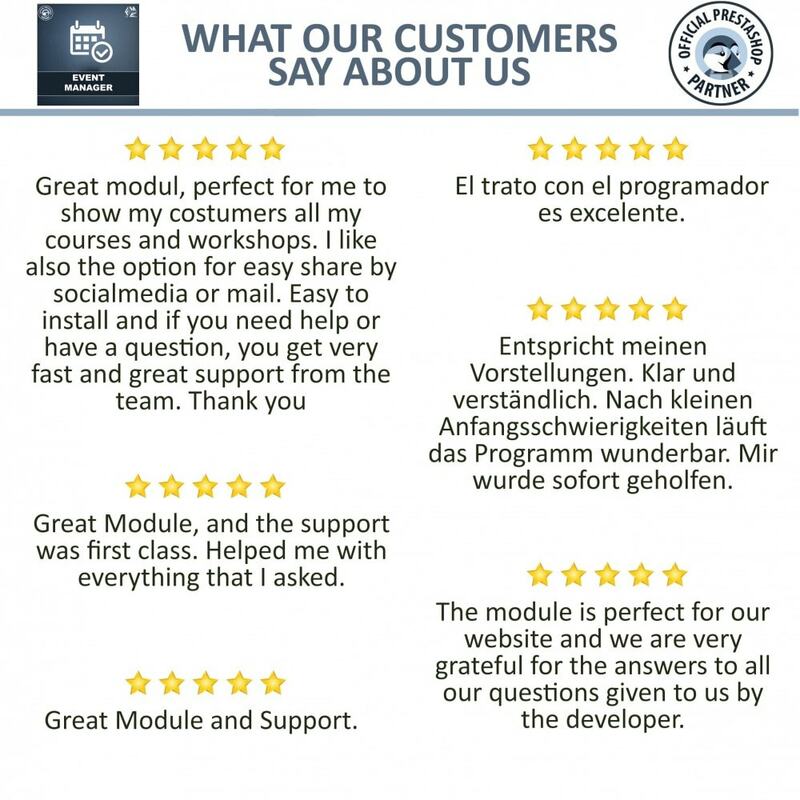 View the DEMO to test all features. A configurable events block can be placed / hooked on CMS & category pages, along with the basic highlights of selected events. The calendar shows events in popup which includes a link of wall page as well as the detail page of that specific event. Social sharing button are add to let viewers share their favorite events on Twitter, FaceBook, Google+ and 20 other social networks. 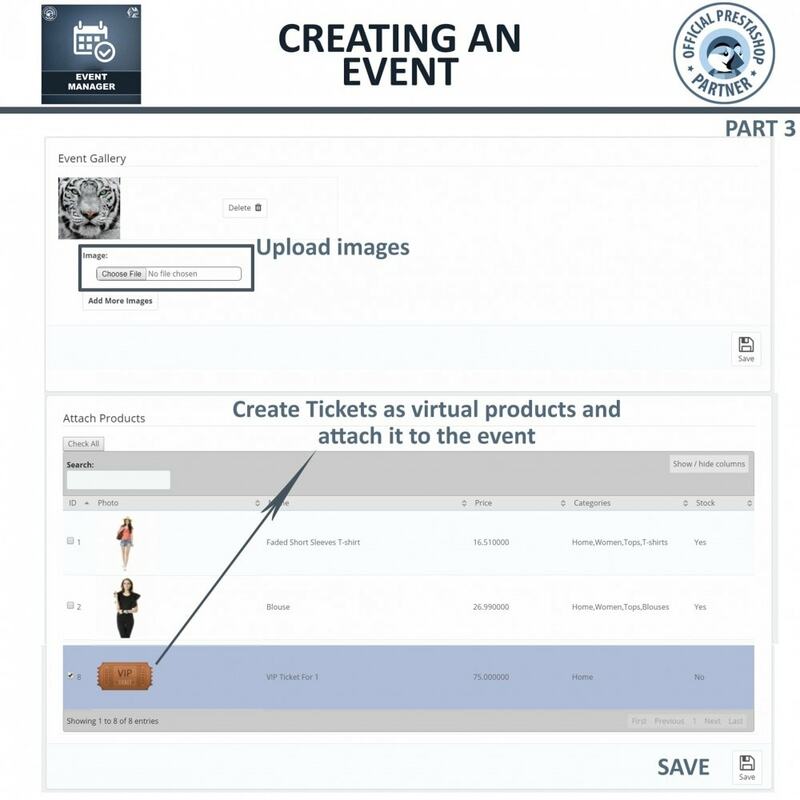 The add-on also includes events ticket system - creating a virtual product and attach with the event. You can customize Metas for event’s main landing page for better rankings in search engines. 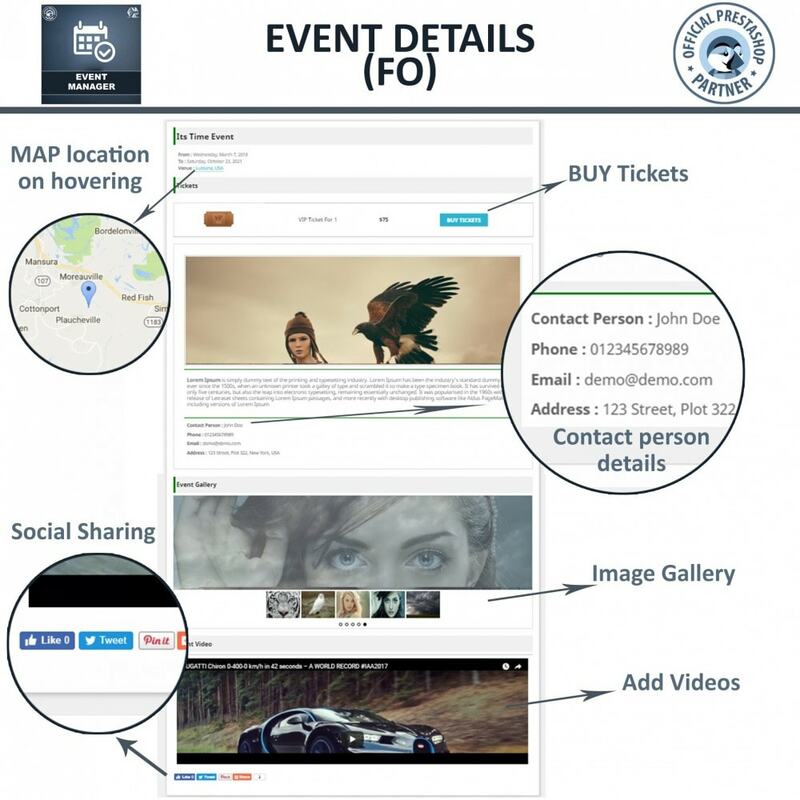 Show venue by using Google maps feature. Events block is included, you can place this block any where on your website such as left/right column, on CMS & Category pages etc. Events image gallery is configurable, set widht and height, animations etc.